Fifteen years after a high school student mysteriously vanished in California, his sister is hoping a new clue will finally bring her family answers. 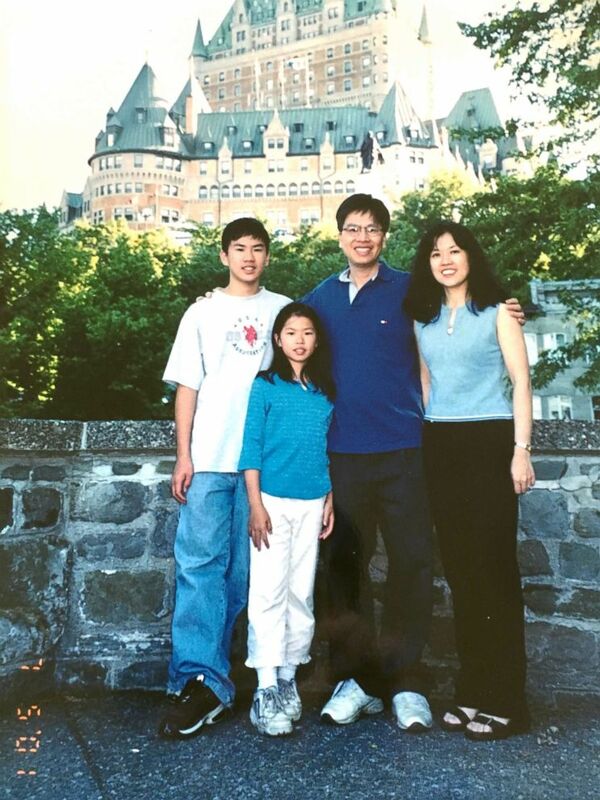 Selena Yuen said the mystery began when Daniel Yuen, her older brother, started struggling with depression his sophomore year of high school in New Jersey. "We were doing everything we could to really help him," she told ABC News. 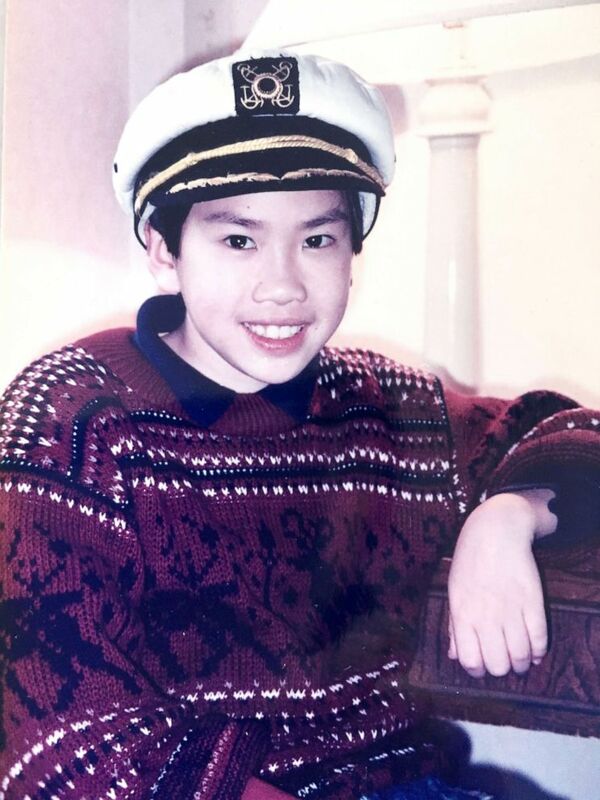 (Yuen family) An undated photo of Daniel Yuen who was 16 years old when he disappeared in 2004. Their parents took him to several psychiatrists, she said, and one of them recommended he attend a boarding school specializing in helping children with depression. In January 2004 Daniel started at the Cedu School in San Bernardino, California, his sister said. On Feb. 8, 2004, 16-year-old Daniel disappeared, said private investigator Keith Raymond. Now, Raymond said Daniel may be living in San Diego. The school reported Daniel Yuen as a runaway to the San Bernardino County Sheriff's Office, said sheriff's office spokeswoman Cindy Bachman. It was reported that Daniel left voluntarily and ran away from the school with none of his belongings or money, said Bob Lowery with the National Center for Missing and Exploited Children (NCMEC). Selena Yuen, who was 12 at the time, called her brother's disappearance "absolutely heartbreaking." "I looked up to him a lot," said Selena Yuen, now 28. "He was kind, supportive, very loyal to his friends." Raymond, a police officer turned private investigator who worked at the now-shuttered behavioral school for eight months, scoured the grounds near the school that first day. He criticized what he described as harsh and controversial punishments by the staff. Students often ran away from the school, which has faced multiple lawsuits, The San Bernardino Sun reported in 2009. The school filed for bankruptcy in 2005 and closed, the newspaper said. Bachman, from the sheriff's office, told ABC News nothing in Daniel Yuen's missing persons report indicated anyone at the school was believed to be engaging suspicious behavior. Is the answer in San Diego? The location that's key to the search is Hilltop Community Park in San Diego. About one month after his disappearance, witnesses in the park reported seeing Daniel Yuen panhandling there, Raymond told ABC News. Raymond said he twice brought in K9s who got "100 percent hits" on Daniel Yuen's scent at the park. Volunteers searched the park to no avail. For Selena Yuen, the mysteries are unending. "We are unsure of why he wouldn't call home ... we're unsure of if he's maybe in some sort of danger," she said. "Every unknown caller you think, 'Oh, maybe it's him, trying to call home.'" Years went by without a lead -- until December 2018. Raymond said he received a voicemail last month from an unknown individual. "Daniel Yuen is fine, Daniel Yuen is still in the same area where you originally searched," the message said. "He doesn't want to be found, he doesn't want you or his parents looking for him." So Raymond headed back down to San Diego. Starting at the same park where Daniel Yuen's scent was last picked up, Raymond said he brought a progression photo showing what Daniel Yuen may look like at age 26 to a park office. A park office employee reported seeing a man who looked similar to Daniel Yuen. The man had been in the park that same day with a white woman and a baby girl, the employee told Raymond. The employee said she spoke with the man, including about what neighborhood he lived in, before he nervously scooped up the baby and left, Raymond said. Raymond ran down the lead, speaking to more witness in the area, including gym-goers who recognized that couple and young girl. Raymond's theory is Daniel Yuen embedded himself with a new family, concocting a story about his past and taking jobs that allow him to work under the radar. "I feel it's Daniel," Raymond said. "We're gonna find him, we're not gonna give up." The possible lead has made Selena Yuen excited -- and cautious. "At first I couldn't believe it ... it's the best news we've had in so long," she said. "It's been nearly 15 years since he's gone missing. Obviously it's been very painful for us over the years. Any news is good news, but also at the same time you have to wonder, is it real?" In San Bernardino County, where there's never been a reported sighting of Daniel Yuen, Bachman said it's still an open case and he's considered a missing person. "He's not in any kind of trouble, but if he is alive and well, we would appreciate hearing from him, and then he would no longer be considered a missing person," Bachman said. "But until then, the case will remain open." 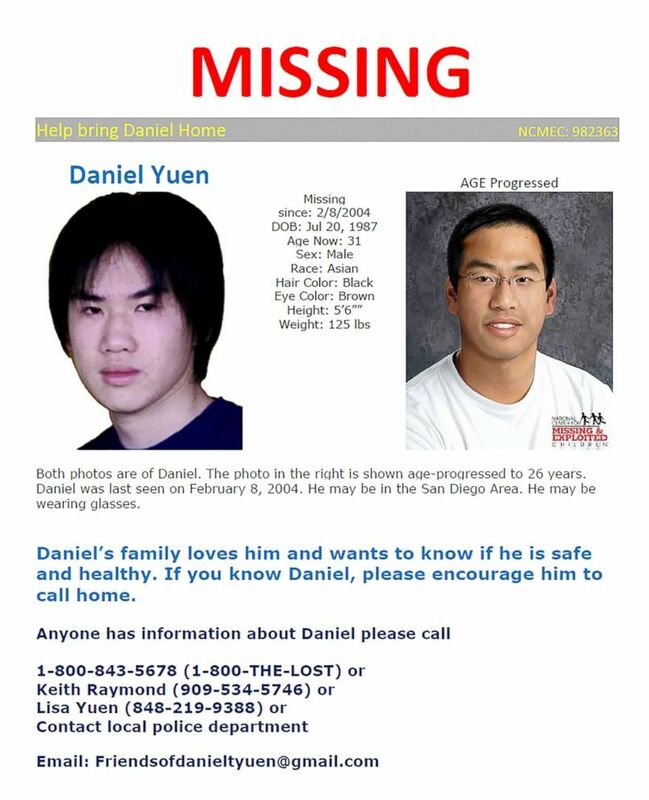 The NCMEC's case file on Daniel Yuen remains open. The NCMEC was in contact with San Bernardino investigators as recently as December 2018, Lowery said. "We find a lot of children after many many years," Lowery told ABC News. "Adults are free to be left alone if they so choose, but obviously in this case we're just interested in making sure his well-being, that he's alive and well, and we can report that back to his family. Not necessarily to disturb his privacy if that's what he's chosen." 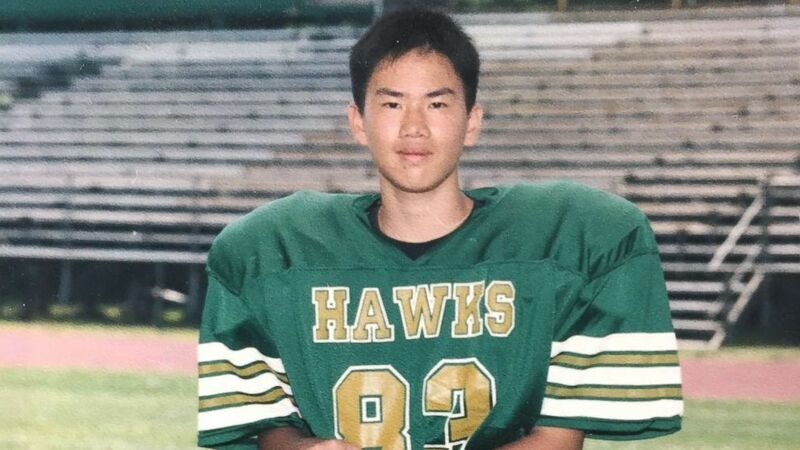 "My family is just really, really hoping that we can find someone who has seen him, knows him or can reach out to him and be able to just ask him to call home," Selena Yuen said. "We just want to know that he's safe, he's healthy." Lowery said, "We remain very hopeful that he's alive and well and that we can verify that for his parents who have been desperately seeking those answers." Selena Yuen and Lowery ask that anyone with information about Daniel call 1-800-THE-LOST.